Tim went out in our garage this morning to get something and thought he heard a little "meow". He left the garage and went around to our front porch area thinking there must be a little kitty out there. Once he got out though he realized the "meowing" was coming from inside the garage! 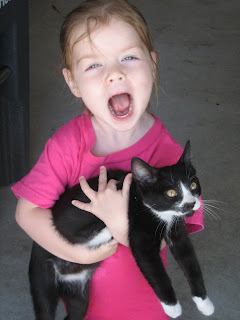 Come to find out, a little kitten had nestled into our garage sometime last night and decided to stay the night! 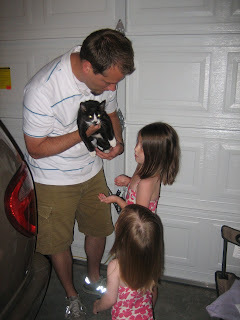 He called us all out to the garage to see her and the girls loved it! We then walked her down a couple of blocks where we thought we had seen her. In a few minutes though we walked back outside and she was standing in our garage again! We let her stay for a while until we could really figure out where she belongs. We finally found her real home and returned her there. It was a fun adventure while it lasted! 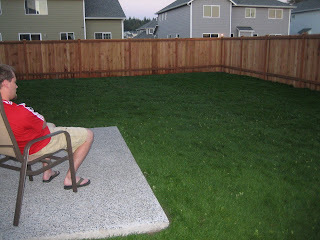 We finally have a backyard! OK...we can finally update you on our backyard! I know you have all been dying to see the progress! OK...well maybe not but we wanted to share! 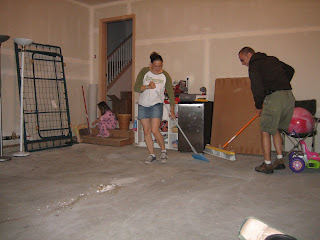 If you didn't see the before pics you can scroll down into previous blog posts to see them! It has come a long way and we are very excited. 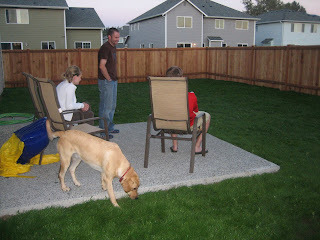 We also had a fence put in and we are really enjoying spending time in the backyard with each other and with the dogs. 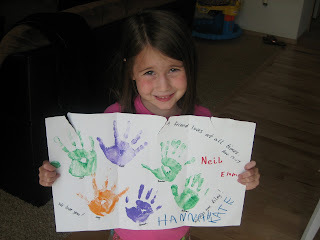 Rylie received a very special surprise this week in the mail...two cards from friends in Carrollton. 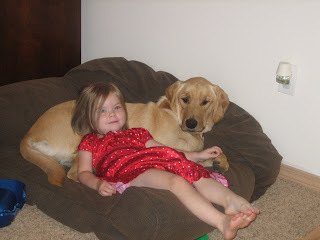 She has a very special friend named Kate who has been so sweet to her through our whole moving process. 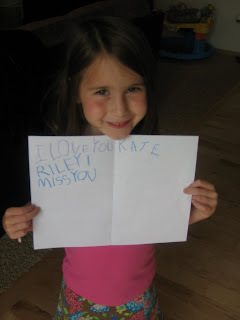 Kate made Rylie a card and sent it to her and then she also had her Sunday School class make her a card! Rylie was SO excited...we had to take pictures! Here are some pictures of her holding the cards! Most of you know that all of our daughters have very different personalities and each add something very special to our family! 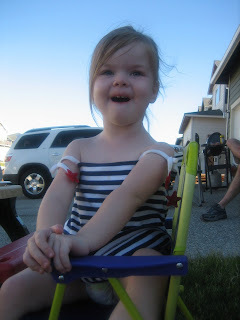 Madison's special "gift" happens to be filling our lives with lots of laughs and smiles! I consider her my "precious challenge"! We had an incident today with her that I think somewhat proves this very fact! We had gone to church this morning and were heading to lunch afterwards. All of a sudden Madison just starts screaming and making a very, very strange noise. I looked back and her left eye was red and very watery but I couldn't get her to tell me what had happened. She finally settled down enough to inform me that she had put a cashew up her nose (yes...salted and everything...which explains the red & watery eye)! I unbuckled quickly, climbed back with her and proceeded to hold her other nostril closed while I had her blow out the other side. After many half-hearted blows I finally convinced her she had to blow really, really hard! After 2 big pushes we had it out! 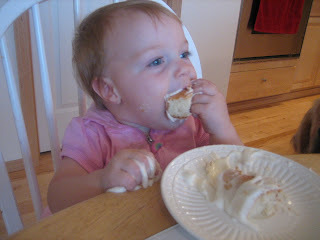 The best part...she then told me she wanted to eat it!!! That's Madison for you...never a dull moment! Needless to say I threw the nut out the window never to be seen again! I wish now I would have saved it just to take a picture, but I'm sure we are safer with it gone! Root, root, root for the hometeam! 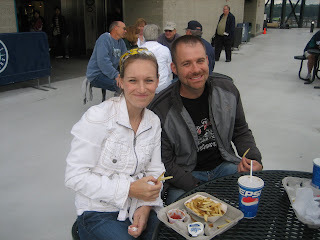 The Puget Sound Baptist Association had a Mariners night recently that we were able to go to with Jason, Becky & Sam. It was a lot of fun and a good "break" from everything going on. I have to admit, it was a little weird rooting for someone other than the Texas Rangers but so goes the famous line of that song! I guess we'll be rooting for the hometeam from now on! 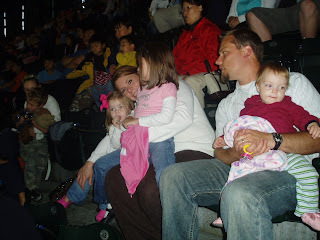 The kids all had a great time and for most of them, it was their first professional sporting event! Here are a few pictures of the night! of course Rylie refused to turn around! We tried to get a family picture and this is the best we got! 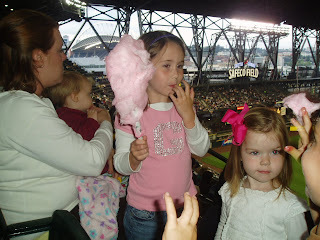 This is the only way we could get a picture of Rylie...when she's too busy enjoying cotton candy to notice anyone has a camera! We couldn't decide what to get Taitlyn for her birthday because the girls already have a ridiculous amount of toys so we decided to get her some dogs instead! Not really...but it kind of worked out that way! 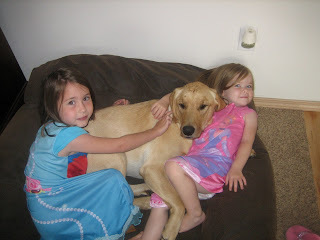 We actually had decided a while back that once we moved and got settled in we would like to get a dog. 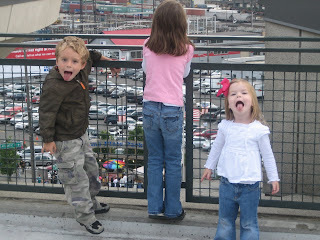 A little side note...for those of you who don't know...Seattle is famous for having more dogs than children! Anyway...we kind of started looking and just checking into rescue dogs. I didn't want to have to deal with house breaking and although I love puppies, I didn't want to have to go through the teething/chew up everything stage either! We soon found a lady that was trying to find a home for her two dogs. They are sisters and are inseparable! We went to visit them and instantly fell in love! They have been through quite a bit of obedience training already and were completely housebroken...yea!!!!! 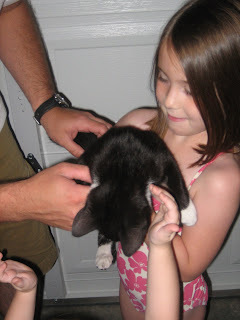 We decided to wait until after Sports Camp was over and then we welcomed them into our home! They are a lab/golden retreiver mix so one looks like mom and the other looks like dad! 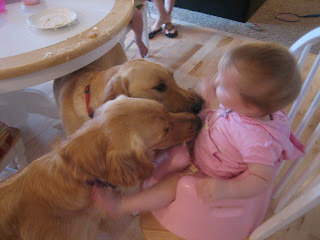 Maggie is the golden retreiver (Shaggy Maggie) and Molly is the lab! They have the sweetest personalities and honestly believe they are lap dogs! They have been great with the girls and have already become part of the family! They had a great time helping clean Taitlyn off after she had her birthday cake! 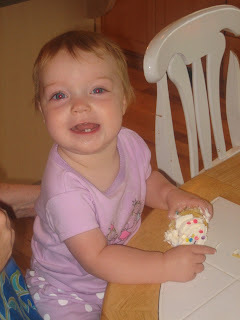 I know that as parents, we always say that time flies by but I don't think it has ever gone as fast as this past year! 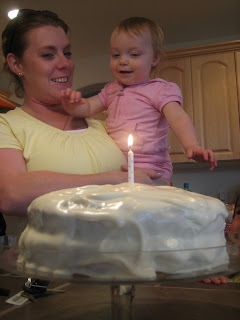 I feel like I blinked and my baby turned one! 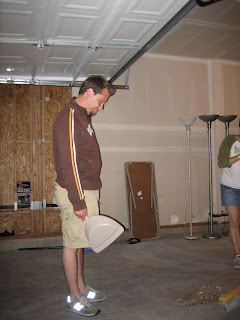 It was a crazy year with us preparing to move, etc. but I think that with her being our third, we are just so much busier. It was a huge reminder to me to slow down and enjoy the little moments in life...ones that only come around once! Her actual birthday was the 13th which was also the week the FBCC group was here doing sports camp with us. 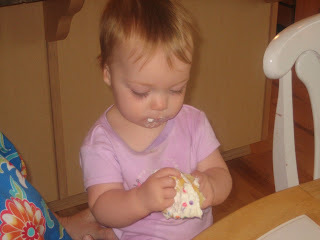 We didn't have time to have a real big party so we just had some birthday cupcakes for breakfast! That night we had a celebration party for sports camp with inflatables, a balloon artist, etc. so we just considered that her party! 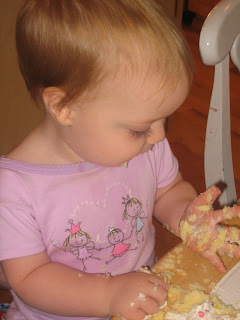 The next day, Becky made her a birthday cake! They all came over and we celebrated again! 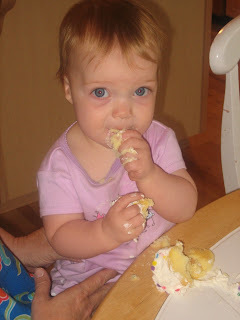 She obviously didn't really have a clue what was going on but she thought it was great that everyone kept singing "Happy Birthday" to her and she was getting lots of cake & icing! 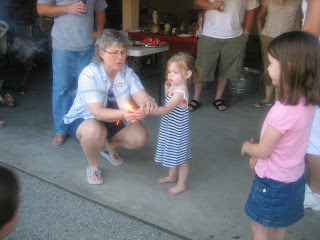 Plus, Mimi happened to be here to help celebrate also which was a very special treat! 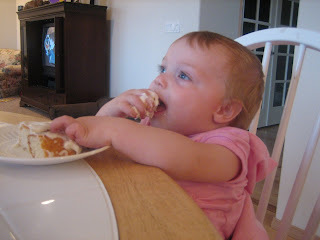 Here are a few pictures of her enjoying her cupcakes and cake! 4th of July Culture Shock!!!! Well...we can officially report now that we have had our first real "culture shock" experience in Seattle! Our neighbors had warned us that people get a little crazy here with their fireworks but I guess we understimated how "crazy" they were meaning! 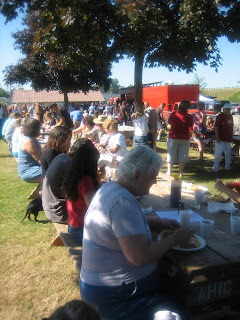 We had an incredible day that included a pancake breakfast that morning that the fire dept. 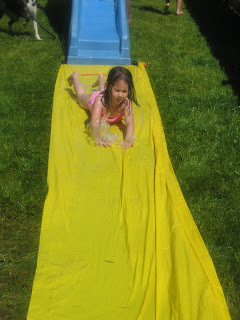 does for the city each year, swimming in a kiddie pool, sliding down our neighbors slide-onto the slip and slide (lots of fun!) and then a great BBQ at another neighbors home. Which by the way...a BBQ up here simply means they are grilling hamburgers and hot dogs. Most people up here don't even know what brisket is!!!! Anyway...we finished the BBQ and came back to our house to light the few small fireworks we had bought. The kids had a great time! Then it got dark! Let me just say...I really think I can explain to you now what being in the middle of a war zone sounds like! Most of our neighbors had their own fireworks show and we're not talking bobcats and smoke bombs. We're talking fireworks shows like what most cities and the Texas Rangers put on!!! I have never experienced anything like it in my life. We literally sat on our front porch, looking straight up in the sky watching fire works all around us. 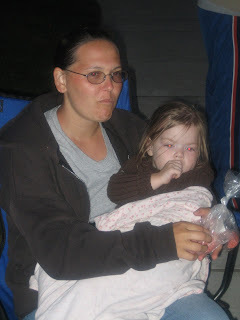 We occasionally had to look away though because the pieces of fireworks (what we call "shrapnel") were falling right on us...and we didn't want to get them in our eyes! This continued on until about 1:00 in the morning at which point they died down enough that we could at least sleep through the explosions! We woke the next morning to find hundreds of pieces of firework left-overs in our yard! It was quite a 4th of July experience! Can't wait till next year!!!! 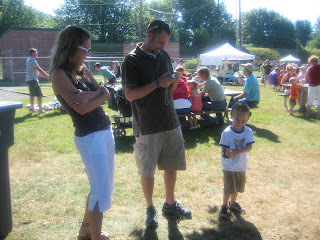 This was at the pancake breakfast. There were hundreds of people from Arlington at the event! Daddy feeding Taitlyn her breakfast! The Cole family after breakfast having a little laugh at something! 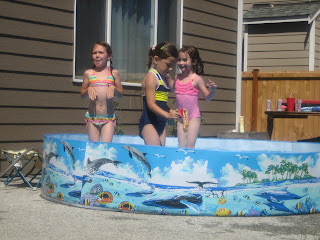 The girls playing "Simon Says" in the pool! 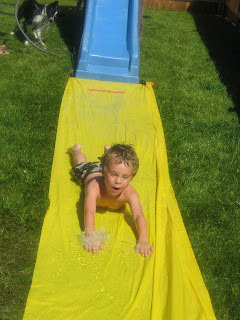 This was the slip n' slide set up! 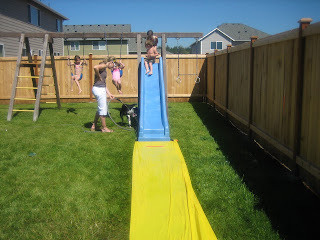 Becky held the hose on the slide to make it extra fast! 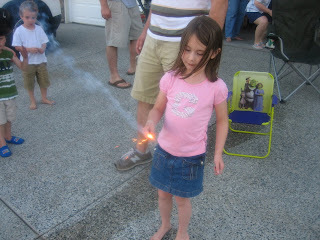 At our neighbors house for a "BBQ"
Rylie with her first sparkler of the night! One of our neighbors was helping Madison with hers! Madison getting very sleepy...but not wanting to admit it! 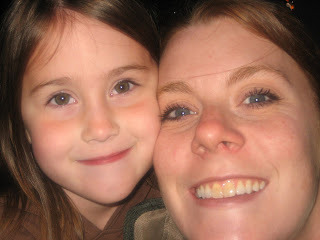 Rylie and Mommy taking a picture together! I know we've mentioned our wonderful neighbors several times but I had to put some evidence of their greatness on our blog! 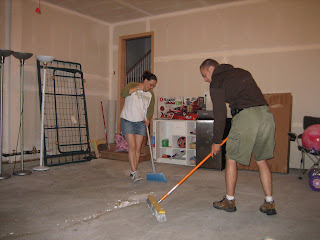 We have been a little overwhelmed lately by the "mess" in our garage...mainly empty boxes, trash, etc. so last night we were working on it a little. Our wonderful neighbors came over to help and we ended up getting it almost completley finished!!!! They are truly the definition of servants! Just whistle while you work!!!! I know this isn't real exciting but it represents a lot of hard work so I wanted you to be able to share in the effort! 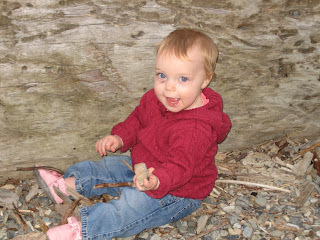 When we moved in our backyard was completely untouched. 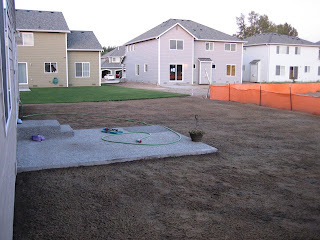 In order to get grass, we had to clean it out (there were lots of rocks - big and small; twigs, and unwanted trash); have top soil delivered; spread the top soil over the entire backyard; and then have it hydro-seeded. 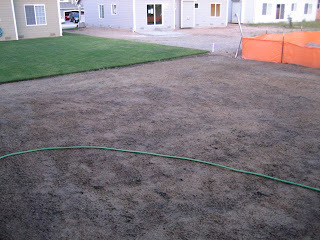 Hydro-seeding is a process where they come and spray your entire backyard with this wet seed-like stuff that will grow into grass into a few weeks! Anyway...it was a lot of hard work and would have been impossible if it hadn't been for Mike & Joyce (the best neighbors ever!) and Jason & Becky! We had to post a few pictures of where it is at now although I could kick myself that I didn't take "before" pics. I'll post some more in a few weeks though with our brand new grass! Another trip to Kayak Point! 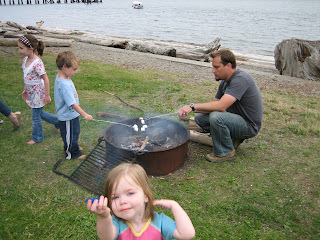 We recently got to visit Kayak Point again but this time we went with the Coles! 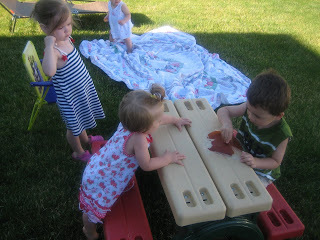 We needed to have a little "meeting" about some Sports Camp issues so we decided to do it over a picnic! We had a great time and the view was still absolutely amazing! 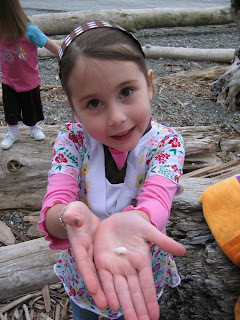 Rylie has officially become our little rock collector! 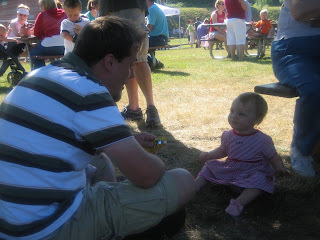 Here she is showing me another one she found and just "has" to take home with us! 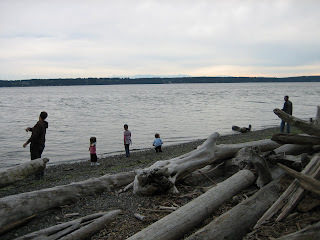 Jason & Tim were "teaching" the kids how to skip rocks. 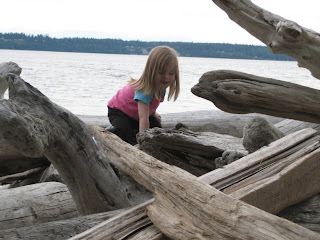 Madison LOVES climing on all the driftwood. Taitlyn showing off the fact that she can stand all by herself! What a big girl!